The Brutale pushes the limits of research and technology in its 2010 models - the 990R and the 1090RR. 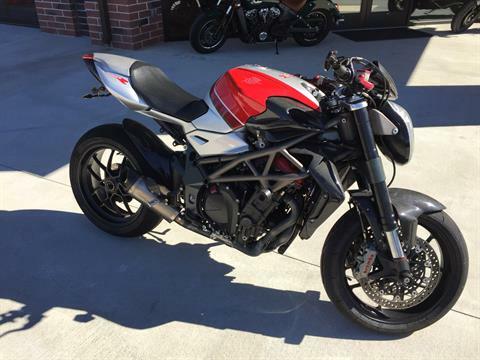 With its state-of-the-art components, the 2010 Brutale delivers acclaimed performance and ease of riding, in keeping with the “Made in MV” formula: A commitment to excellence in componentry, in the design of which MV Agusta is at the forefront. The “easy” handling enable the Brutale to compete with the Japanese nakeds: it is agile and instinctive in the hands of the rider. It excels on the racetrack, and its eclectic elegance and charm thrill even the casual admirer. The headlight retains the same drop profile and the same dimensions, but introduces a fresh, more modern design, which takes account also of a modified support, but eliminates the direction indicators. Inside, in addition to a new poly-ellipsoidal element, there is a system of&nbsp;eight LEDual Sport that create a “light strip” effect, like that found on cars, which for motorcycles is entirely new. The fitting of the handlebar is flexible, to improve comfort and to reduce the vibration level. On the integrated handlebar clamps, the upper triple clamp assembly, including the handlebar clamp, is new. This latter has been designed with an elegant hinge release system, which enables the handlebar group to be quickly dismantled. The handgrips also have a new design, with an alternation of smooth and rough areas that improves grip. The rearview mirrors are larger and have more volume for greater visibility, but have also been placed higher up than before; the arm is in pressure dye-cast aluminum, to reduce vibrations and to improve stability. They house LED direction indicators (three on each side), which are perfectly incorporated into the rear mirror assembly, yielding a cleaner line than the traditional position. The new lines of the instrument cluster have abandoned the soft shapes of the previous cluster to achieve a style that is in keeping with the modern, slender features of the bodywork. It is designed to fit a personalized, interchangeable cover, which the rider can select from those available in the accessory line. The instruments are also all new, working in conjunction with the engine control module via a high speed CAN line, retaining the split dial, with the rev counter, which is even more precise. The two LCD screens have been enlarged and have even more functions. There is now an indicator showing which gear is engaged, the fuel level, the speed, the hazard key, the water temperature, and the chronometer function, with memory of laps and of times. The instruments are already set up to use a system for monitoring tire pressure. The ignition block is the very latest generation, fitted with an immobilizer, the presence of which is indicated by a red light on the instrument cluster. The fuel cap is also new, with an advanced design in which the MV name stanDual Sport out on the back, thanks to careful and precise manufacturing. The air ducts for the air box are larger and tapered directing additional airflow. The radiator protections, no longer in metal and integrated with the mechanical components, are now part of the bodywork. In addition to streamlining the radiator and protecting it, they act as ducts to provide better cooling. The most EVOlved part of the motorcycle is the rear, thanks to a thinner, more modern tail, which makes sitting more comfortable. The LED taillight is integrated into the tail, which is no longer in plastic, but is pressure dye-cast in aluminum, and is an entirely new design element. The two beautiful exhausts, which flow along the right side of the motorcycle, have been enhanced, eliminating the welding at the tips of the silencers and, above all, featuring an even more inclined and thinner cut that matches the lines of the bodywork. The external engine supports are sleeker and, along with the side stand, are embellished with the MV logos in relief. The engine size has increased from 59.9 ci (982.3cc) to 60.9 ci (998cc) without any variation in layout. The cylinder bore and stroke have gone from 3.11 x 2 in. (79 x 50.1 mm) to 2.99 x 2.17 in. (76 x 55 mm). The reconfiguration of the 4-cylinders, with 16 radial valves, seeks to make power delivery smoother, with a response that is more progressive, solid, and harmonious than before, especially when opening-closing and when accelerating. For this purpose, a new 1.8 in. (46 mm) Mikuni throttle body assembly, with a non-return feed that is 0.33 lbs. (0.15 kg) lighter than the previous one, has been installed. The new throttle body assembly is operated by Marelli 5SM electronics, which perform better than the previous, and which feature new software for such things as traction control (for which eight adjustments can be made) and a double EFI map. No alterations have been made to the materials, measurements, and profiles used on the thermal side, but the new electronics allow for the elimination of the position sensor of the camshaft. The completely redesigned engine crank case is 1.32 lbs. (0.6 kg) lighter than the previous one, and is fitted with a counter-rotating balancing shaft to resist high-frequency secondary vibrations, which has been placed at the front of the engine and is driven directly by the primary transmission gear. While the transmission ratios remain the same, the internal gearbox command mechanism is entirely new, redesigned to allow adopting a gear sensor, and to provide a smoother and more comfortable shift of the lever. Using this new sensor, the engine control unit is able to optimize the injection and ignition calibrations and the position of the exhaust valve according to the demanDual Sport of the individual gears. There is also a new Mitsubishi, Neodymium-Iron-Boron generator, cooled by a high pressure internal oil jet, which - together with the new transmission system and a damper that incorporates an elastomer vibration canceling system - contributes to saving a full 3.52 lbs. (1.6 kg). The lubrication circuit has also been entirely renewed, with a double rotor pump which is smaller and lighter (by 0.75 lbs. ), but more efficient than the previous one. The circuit is no longer divided, as it was before, and the pump serves the radiator and the engine which are placed in series. The new oil filter has an environmentally-friendly paper element, which is easy to access without dismantling any part of the engine, thereby reducing maintenance time. The water pump, too, has been completely redesigned, and although it is 0.13 lbs. (0.59 kg) lighter than the previous one, its cooling capacity is up to 65% greater at low revs. 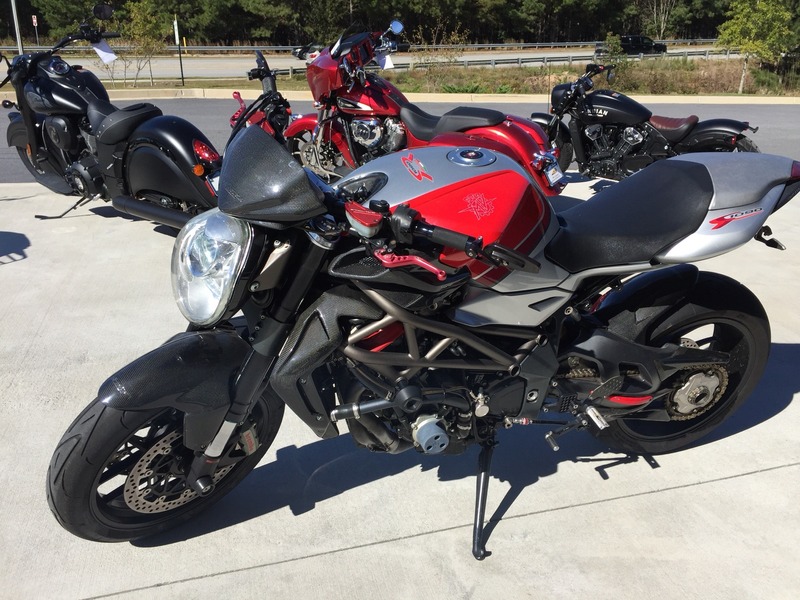 The 1090RR model shares all of the basic characteristics of the 990, but has a 65.8 ci (1,078cc) engine offering even greater power and performance. The extension of the rear swingarm (which has been entirely redesigned and is 2.2 lbs. lighter) lengthens the wheelbase for greater precision in the ride, increasing the torsional rigidity and decreasing the weight. 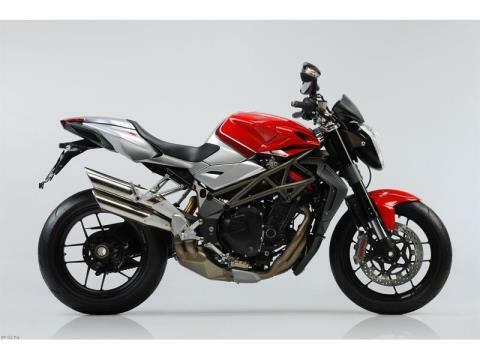 The new wheelbase also reinforces the Brutale’s signature stability. The weight reduction in the wheels and swingarm provides improved suspension operation. With an innovative design, the rims are even lighter than those on the 989R; they are gravity dye-cast, with a weight that is 1.5 lbs. (0.68 kg) less on the rear rim, and 0.77 lbs. (0.35 kg) less on the front. The front forks have had their internals and oil dynamics completely designed by CRC, and are produced by Marzocchi exclusively for MV Agusta. The stems are 2 in. (50 mm), and the compression, extension, and spring preload may be adjusted. The internal components and the calibration have been modified, with the range dropping from 5.12 in. (130 mm) to 4.92 in. (15 mm). The front wheel trail has been increased from 3.99 in. (101.5 mm) to 4.07 in. (103.5 mm), the wheelbase extended from 55.51 in. (1,410 mm) to 56.61 in. (1,438 mm), the height of the seat from 31.69 in. (805 mm) to 32.68 in. (830 mm), and the angle of the steering tube increased from 24.5 to 25 degrees. The braking system includes 12.2 in. (310 mm) NHK disks, a steel flange and Brembo 1.26 in. (32 mm) radial mount 4-piston calipers.